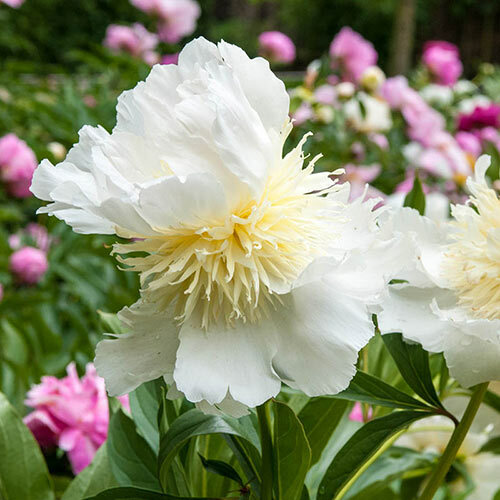 If you're not in the mood for classics, why not branch out to score double takes with your peony garden? These lacy flower forms are strikingly ornate over lush green foliage. 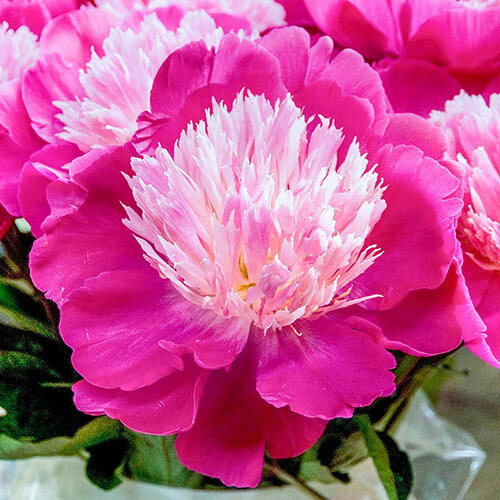 The flowers are long-lasting in cut floral bouquets, and the foliage stays attractive even after the bloom season is through. 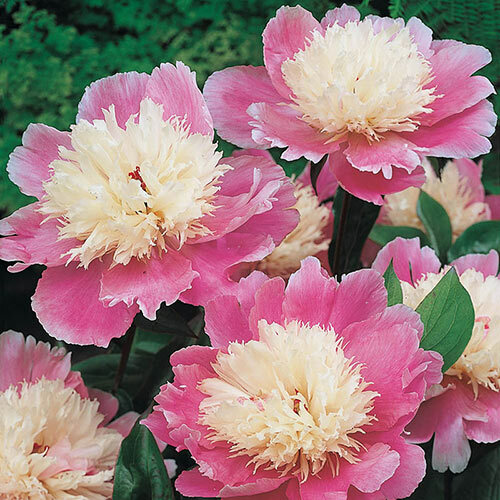 The Fantastic Frills Peony Collection will make your green thumb look impressive, but it's actually very easy to care for. It will remain beautiful through decades—truly a generational plant. Put it in borders and watch spring butterflies dance over the blooms. 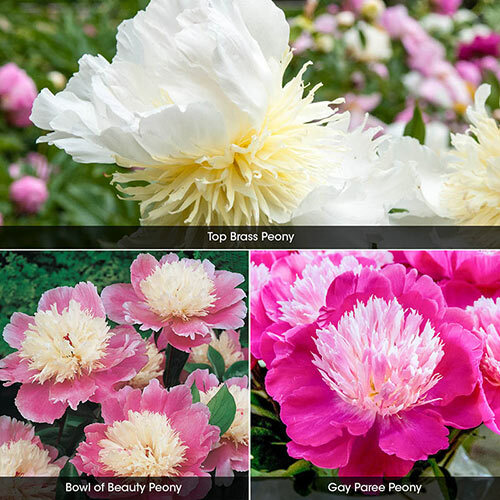 All three varieties—Plainsman, Gay Paree and Bowl of Beauty—are delightfully fragrant. 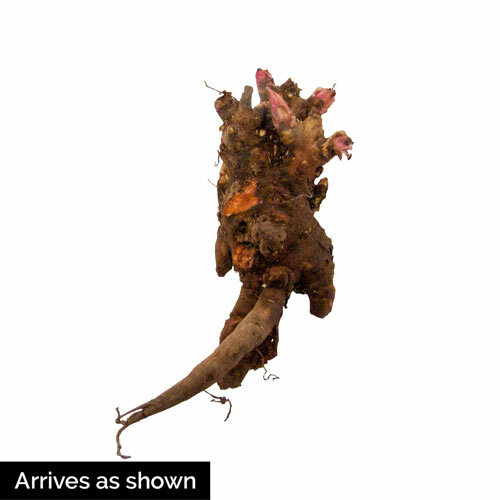 Planting InstructionsPlant with eyes 1 1/2 - 2" below the soil surface. Firm soil around the roots and water thoroughly. Planting too deep will result in poor flowering. Winter CareMulch the first winter, to prevent plants from heaving from the ground during periods of freezing and thawing weather. Remove the mulch early in spring, before new growth emerges. Flower FormLarge, bowl-shaped flowers. Several rows of broad outer petals curve around numerous densely arranged narrow petaloids. Foliage TypeGlossy, deep green leaves that are very ornamental throughout the growing season. New growth in spring is a copper-burgundy color. ResistanceExcellent resistance to pests and disease. Soil RequirementWell-drained, humus-enriched, moisture-retentive soil. PruningRemove spent flowers to keep plants attractive. After flowering. Unique CharactersticsOne of the most attractive Alocasia. Introduced from the Philippines. Grown for its large, soft textured leaves with black shading around its prominent veins. Easy to grow and requires little more than watering in dry spells and fertilizing for optimum growth. Unique CharactersticsThe white guard petals surround a high center of ivory with a hint of pink and a blend of canary yellow. Depending on the time of day and the age of the flowers the colors will appear different.